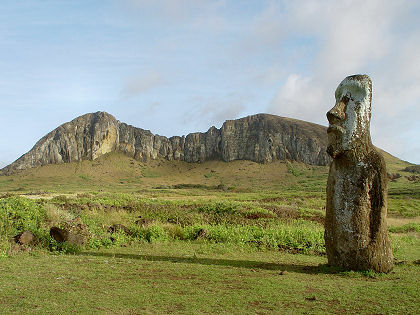 Rano Raraku as seen from the southeast coast road. I took this picture the next morning. 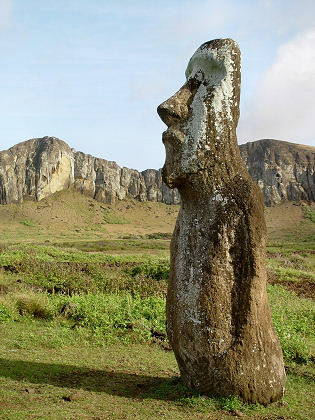 These two pictures show the single moai at Ahu Tongariki in the foreground with Rano Raraku in the background. Tongariki has 15 moai on its ahu, but there's another single moai standing off to the side. I took this picture the next morning. The previous evening, I had seen a postcard in a souvenir shop with this same view, and I vowed to duplicate the scene with my own camera. 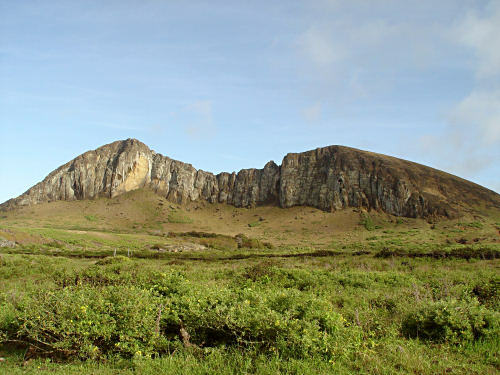 This is a side view of the eastern side of Rano Raraku. You can see how the craggy cliffs at left slope down to the more eroded rim at right.